This post was meant to be my mother's day wish list / gift guide but life happened and it never went up in time. We were away from home (in North Carolina) celebrating hubby's MBA graduation. I could have had it up prior to leaving but time just slipped from me. 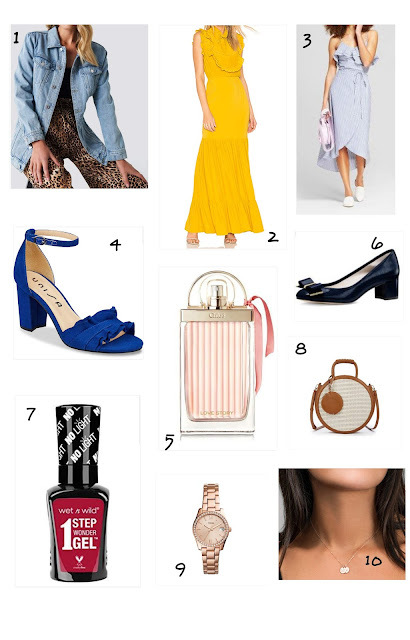 Nevertheless, I am posting now and we'll just call it the May Wish List because, I truly love all the items on here and some I really need (big grin). 1//Oversize Denim Jacket// Believe it or not, the only denim jacket I own is from back in high school from Amanda Bynes collection, anyone remember her? I think it's time to add a second option from this era. Since that one is more fitted, I think an oversize one will be ideal. I have also linked more options here and below. 2//Maxi Yellow Dress // Maybe I do not have a favorite color after all or maybe my favorite color is just always changing. Either way, I am currently loving and extra attracted to anything yellow. Or maybe it is my happy color. This dress is just lovely all around. 3//White and Blue Stripe Dress// White and blue stripe is a classic and one that will probably never get old. I especially love this one for the wrap style effect , hi-low length and ruffle details. And the price is just right. This one is already in my closet. Hope to share when I style it. I have included a similar one, an actual wrap dress here. 4//Cobalt Blue Sandal//Ok, I am officially into block heels. I used to use work as an excuse, but I think I have fallen in love with them in the process. It's hard not to fall in love with comfort. Block and kitten heels are becoming a thing in my closet and I am loving it. That doesn't mean I'm getting old, does it? 5//Chloe Love Story Perfume// Just because I need a new scent and this one has good raves. 6//Block Heel Pumps// Same as number 4. Plus this one is simply classic with the bow and the navy color. And the price is amazing! 7//Wet N Wild Wonder Gel Nail Polish// I cannot tell you how much I love this nail polish and since discovery it, thanks to another blogger, I have not used any other brand of nail polish on my finger nails. All my old collection now belongs to Eliana (shhh...don't tell her yet). The closest thing I can compare it to is getting the shellac /Gel manicure, which I've had in the past. This polish keeps and strengthens your nails - no breakage at least not easily, doesn't peel or chip the moment you touch water, last up to 2 weeks and depending on how often you wash dishes, or cook, it could last longer; and the best part, no UV light required, no top coat required, dries fast and you can remove with regular nail polish removal. No need for foil and soaking your fingers and all that ceremony. I'll leave it there! I had issues finding more color options in store and just realized they have them online as well. Now, I can have a proper collection. 8//Canteen Crossbody Bag//Basket bag are becoming a thing. Majority of them I find non-functional. Half falls into the category of completely see through, making it impossible to put anything of value in there without a secondary purse, and other half is just to look stylish as they are small and not for day to day functions. I find this one strikes the perfect balance between functionality and style. Big enough to hold everyday essentials and still have that basket/natural feels. 9//Gold Bracelet Watch//I currently have 2 pairs of "good" watch I wear on a daily basis and they are both silver. Thinking this rose gold one will make a great addition. 10//Personalized Dainty Disk Necklace//I have always wanted something with my kids name to wear and I love this dainty necklace. I especially love the fact that it is delicate and subtle and not overpowering or all out there. It helps in keeping it even more personal because if you're not close enough to see, you'd think it is just a regular necklace. 11//Yellow Tassel Earrings//Missing from the picture are these gorgeous yellow tassel earrings. Budget friendly ones here. Perfect timing as Memorial day is upon us. Sure some of these items will go on sale so Happy Shopping! I love yellow, it's one of my favorite colors to wear. I just never find enough yellow stuff though, I guess it's window for being a popular clothing color is very small!